This webcam needs to manual focus. Before using, please adjust the lens sharpness. Method：Just use your finger to Spin the focusing ring (at the very front of the camera lens) clockwise or anticlockwise until the video becomes clear. After the installation, the webcam could not generate a shortcut icon in the computer, it will need some software to open the camera, such as Skype, etc. 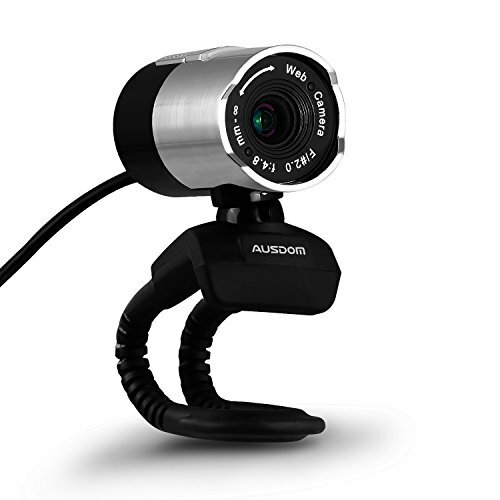 HD web camera for video chats and image and video recording, work with youtube skype facetime etc. High-resolution, build-in microphone with noise reduction and recording functions. High definition 1080P camera provides 2.0 super-large aperture making first-class shots possible even in poor lights. Flexible Stand for desktop, laptop, or stand-alone use. Supports 360°rotation, and the camera mount is 180°adjustable. Compatible with Windows XP/Vista/7/8, the USB 3.0/USB 2.0 Connector for easy plug in, super easy to use. If you have any questions about this product by Ausdom, contact us by completing and submitting the form below. If you are looking for a specif part number, please include it with your message.